At the Black Cultural Assembly. CSUSB and the city of San Bernardino are celebrating Black History Month with events aimed at raising awareness about the significant legacies of black culture. The Fifth Annual Pioneer Breakfast was held on Feb. 24 at the Santos Manuel Student Union Events Center. “We started the Pioneer Breakfast five years ago and we are happy and excited,” said Facilities Coordinator Anthony Roberson. “When we first started the program it was small and now we have grown so big it sells out every year, it is a wonderful event not only for our campus community, but also our surrounding CSUSB service community as well,” Roberson continued. It was a celebration of “Leadership, Legacy and Lineage” honoring community leaders. Tickets were $20, with all proceeds benefiting the annual African American Graduation recognition ceremony, according to CSUSB News. The Black Student Union (BSU) is a movement that is committed to promoting and accomplishing academic excellence while also giving both the African and African American community a voice. BSU, the Student African American Brotherhood (SAAB), and Student African American Sisterhood (SAAS) have been honoring Black History Month by hosting a number of events such as: Black History Assembly, Speak Yo Truth, The ‘N’ Word, and Don’t Tell Her She’s Pretty for a Black Girl. These organizations are also coming together to work with the Helping Hands Pantry to feed homeless in the community. 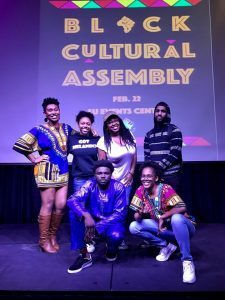 “Black History Month is American history, the events are open to everyone, and everyone is welcome,” said BSU member and student Prince Ogidikpe. “It is an opportunity to learn more about the culture and it brings the community together,” Ogidikpe continued. The San Bernardino community is also recognizing and celebrating Black History Month. The city of San Bernardino held its Second Annual Black Chamber of Commerce Inland Empire’s (BCCIE) Black History Super Expo on Feb. 4th. The community came together and shared stories about issues, and long lasting legacies in global culture like music, literature and architecture. The San Bernardino Public Library hosted play about the 1881 trial of Lt. Henry O. Flipper, the first African American United States Military Academy West Point graduate. The exhibition will run from Feb. 11th to April 8th, and features the works of 13 highly-renowned painters. Four generations of African American women in the art world from the first half of the twentieth century until the present are featured in the exhbition. The San Bernardino County Association of African-American Employees 19th annual Black History Month Celebration on Feb. 23 at the Sierra Lakes Golf Club in Fontana included a dinner, a silent auction, keynote address, music, professional networking, and dancing, according to The Press Enterprise. Black history is an important part of American history.